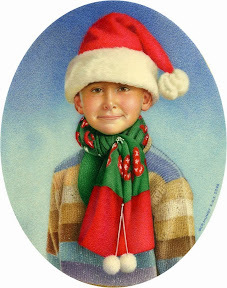 Now that my exhibition is well under way I've been able to devote myself to Christmas and get on with the commissions promised before next Tuesday. 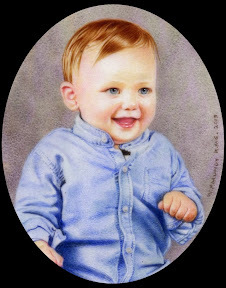 This miniature portrait of a lovely little 6 month old baby called Felix was delivered to his grandparents the other day. They loved it and told me they intend to give it to the parents. The other day my young friend and I went to see the latest Hobbit film. I was pleased it was the 2D version as although it would have been quite spectacular in 3D - especially the last half hour when an enormous fiery dragon was roaring its way through a vast underground cavern - but having only one good eye, the 3D effect doesn't work for me, unfortunately. 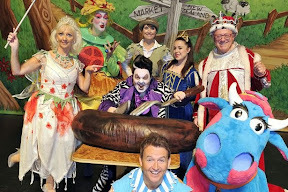 Last night my young friend and I took my great niece Kate and her mother Louisa to the pantomime, Jack and the Beanstalk, in Reading. It was fabulous. 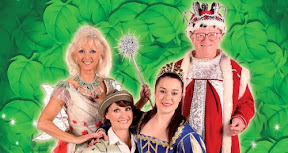 Debbie McGee played the part of the magical Queen of the flower fairies. The costumes, sets and scenery were great - and as for the giant, apparently it is the biggest giant in pantomime. At least 20 feet high, I have no idea how it worked, but it was stupendous. 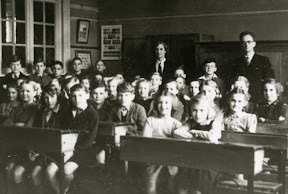 The pantomime had so much colour. Such a happy cast. However the most thrilling scene for me was the dance of the cockroaches! All the performers were covered in shiny black costumes. Great. We had a little chat with Debbie at the stage door after the show ended. Kate had a great time. 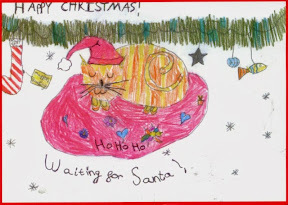 Talking of little Kate - she's 6 by the way, this is the Christmas card she painted. It was printed by her school. This afternoon I took the miniature I've just finished round to Mike Read. It's of his girlfriend Vanessa. Hope she likes it as much as he seemed to. 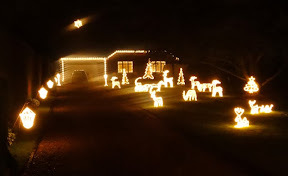 I'll see if I can show it on my blog after Christmas. The rest of today I spent working on the model of my young friend's garden I've been making in my spare time over the last few weeks. Nearly done, now I just have to wait for the glue to dry to finish it off. 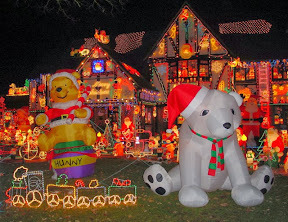 It's nearly Christmas. All my presents (over 60 of them) are wrapped and ready for delivery over the next couple of days. So no more painting or drawing for a little while. 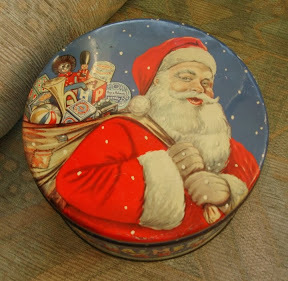 Just a few Christmas images - starting with a Father Christmas biscuit tin I designed many years ago when working as an apprentice at Huntley and Palmers.